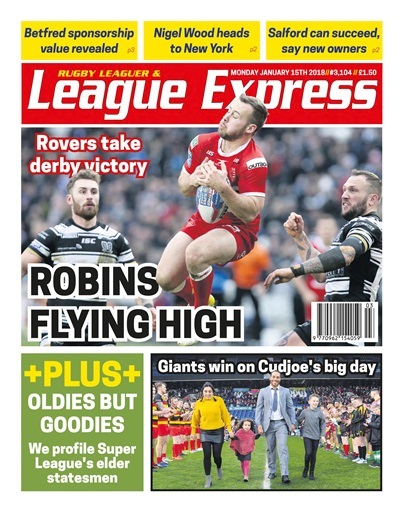 Rugby league is in a fascinating position with the new season just a few weeks away – and this week’s League Express has all the latest goings on from the sport. We’ll bring you details of a big week for New York City’s proposal to enter the RFL..
..while we’ll also bring exclusive news on TWO more North American cities who want in as early as next year. Betfred extended their sponsorship of the sport into Championship and League 1 last week – but how much was it worth? We’ll tell you. There’s an exclusive interview with the new owners at Salford Red Devils – who open up to us about the state of the Super League club heading into the new season. 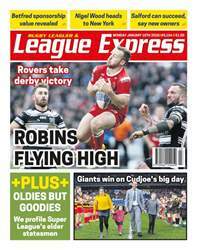 The debate on reserve grade is rearing its head again.. we speak to one League 1 club who are leading the way..
..while telling you one Super League club who is in, and another who may well be out. Who will captain Wakefield in 2018? We asked coach Chris Chester – and he gives us the answer. Paul McShane committed his long-term future to Castleford last week – this week, we’ll tell you who the next big name to sign a new deal is. Hull KR star Danny McGuire hits back at the critics surrounding the Robins’ recruitment for 2018. Michael McIlorum discusses the reasons behind leaving Wigan – and just who had the final say in whether he stayed or left. Hull FC star Albert Kelly has some very interesting things to say about his future.. FC fans, make sure you pick up a copy of this week’s paper. Garry Schofield sets out his wishes for 2018, while our editor Martyn Sadler suggests that Rugby League should be relaunched.